Poor Man’s Pizza, another recipe passed down from my grandmother. I really don’t know why my grandmother called this poor man’s pizza, I never asked. I learned how to make this by watching her. Although my grandmother made it best, isn't that always the case? This is a great snack, or you can serve it with dinner because it's like garlic bread only in pizza form. This is very simple to make and if you don't want to take the time to make the dough. Just pick up a pre-made pizza shell or most stores will have dough already to use. Then it becomes very quick and easy. So if you happen to like garlic, give this one a try. Poor Man's Pizza is great served with a nice salad and your favorite pasta dish, and of course a glass of wine. I like using my KitchenAid Stand Mixer for making the dough. Spread the dough in the pizza pan, you can make it thick or thin, I really like mine thin and crispy. I use my handy Norpro pizza dough and pastry roller, it's really a big help. Today there are so many Hi-Tech kitchen tools to choose from. Slicers, deicer's, blenders, and food processors the list goes on and on. 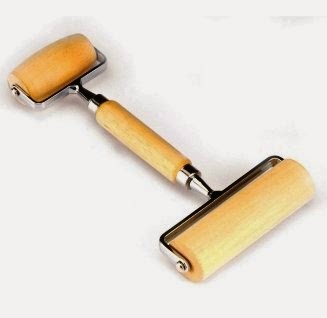 Norpro Deluxe Pastry and Pizza Roller take me back to the basics of kitchen tools. Something so simple that is such a huge help in the kitchen; and no electricity, you don’t even have to plug this in. The word deluxe in the title makes you think this is Hi-Tech, but it's just simple. If you like to bake pies, make homemade pizza, or homemade pasta this is the handiest tool you'll ever have. I make my own homemade pizza, and you would think by now that I could toss the dough in the air and twirl it around and then throw it in the pan. I'm sure you've seen those guys on television or those little pizza shops around town do this at one time or another. Well, I'm not that good, and that's why I have this handy tool. What makes this nice is that I'm spreading my dough while it's already in the pan. 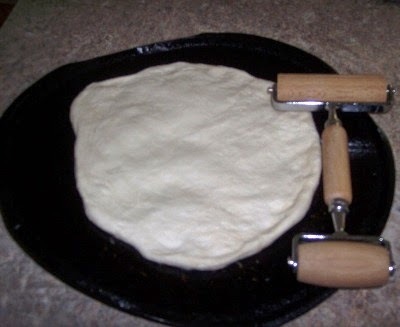 The large roller will spread the dough almost to the edges of the pan. The small side will roll the dough right to the edges, then I press the edges to form the crust. It's also great for pie dough, and homemade ravioli. If you don't have a pasta machine to roll the pasta dough this is the tool that you'll want to have in your kitchen. For ravioli, roll the dough long and wide enough, then spoon in the ricotta cheese, fold the dough over, and cut the individual ravioli. Use a fork to crimp and seal the edges. We are certainly in the cold season now, and when it gets cold outside we like our soups. There is nothing better than serving your family a hearty and healthy bowl of soup. I like all kinds of soups, especially in the winter months, which happens to last a long time in here in Western New York. Here is a recipe that my we found on-line last year called Italian Peasant Soup. This is a recipe by Kim Knight of Hamburg, Pennsylvania. We’ve made this a few times now and I've got to tell you it is absolutely delicious, and easy to make. So a big Thank you to Kim Knight of Hamburg Pennsylvania for this recipe, I love this soup and hope many other people will enjoy it. As Always Thanks for stopping by, I hope you try Kim's recipe. Cooking for just two people, one of our most used cooking utensils has become our eight inch non-stick fry pan. We use it for eggs, omelets, grilled cheese, crepes, pancakes, and just about anything on a smaller scale. Of course we do have a full set of pots and pans; I'm just saying that our eight inch pan is the most used. So when we ruined our favorite eight inch non-stick fry pan by leaving it on the burner for hours with the burner on of course, we needed to find a new one. I had seen the television ads for this new Orgreenic non-stick cookware, so I figured why not give it a try. So I went out and bought the eight inch Orgreenic Fry Pan, and got a little education at the same time. This Non-Stick cookware is Eco Friendly, but I’m not going to give you all of the technical details, because you can read all about them on-line. I’m going to be 100% honest with you here, the ads say that you don’t need any oil, grease, or butter while cooking, and the food won’t stick. I seasoned the pan according to the instructions, but the first time I used it the food did stick. I don’t view this as a negative aspect of the product. I use just a little cooking spray and nothing sticks to this pan. I’ve read many negative reviews on this product, but on the other hand there are just as many positive reviews. We’ve used this pan for the last two years and it’s still like brand new. 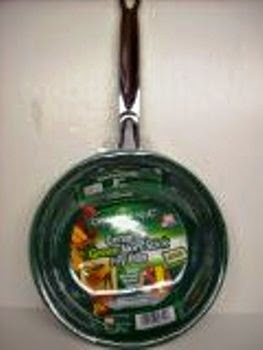 I give the Orgreenic pans Two Thumbs UP!! As always Thanks for stopping by, and your comments are welcome. The weather is beautiful and our Huntington gas grill is hot and ready to go. There is nothing like baby back ribs on the grill. My son Sam, and his family decided to make the 2-hour drive on Father’s Day to surprise me. What a beautiful day we had, we barbecued some baby back ribs on the grill. This was really simple to do; I bought two packages of baby back ribs and picked up some extra barbecue sauce. My son cooked these to perfection and here is how he did it. To make this day even better, my daughter came over with stuffed artichokes and stuffed peppers. Needless to say, I was one happy father, my kids are the greatest!! I can’t wait until next Father’s Day. 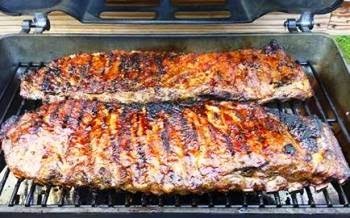 Please share any tips that you may have for ribs on the grill. As always Thanks for stopping by. So you're finally home after working all day, and you realize that you really haven't thought about dinner. Tonight is your meatless night or maybe you're a vegetarian. This is a great recipe that my wife whips up in no time at all. Well it does take her a little time, but it could go even faster if I help. Spaghetti with fresh bell peppers and onions is a nice, easy light meal, unless you eat the whole pound of spaghetti. There are so many variations to this, you could use whatever vegetables that you like. I prefer the fresh peppers and onions because the peppers are so sweet and have such an amazing flavor. I like to top it off with some fresh ground black pepper and just a sprinkle of red pepper flakes, just for a little extra kick. Give me some feed back and rate this recipe, and as always Thanks for stopping by. Broiled asparagus with pistachio nuts is a wonderful side dish to serve with a nice steak and baked potato, or with any meal. There are all kinds of articles on the health benefits of asparagus. I'm not going to go there because you can look them up anytime. If you like asparagus, and I do, this is a quick, easy and tasty way to make it. This takes about 2 minutes of prep time and 10 minutes to cook, and it just tastes so wonderful right out of the broiler. Give it a try you're going to love it. Add a little more flavor by squeezing a fresh lemon wedge over the asparagus right out of the broiler. 1 small bag of shelled pistachios (option walnuts or pecans) or none at all if you don't like nuts.